Ahead of general elections in six months, the snooping allegations have put Bharatiya Janata Party’s (BJP) prime minister-designate Narendra Modi on the backfoot, especially when the saffron party's responses to the charges have been weak and unconvincing. Narendra Modi has topped several recent opinion polls, but the charges could tarnish his carefully crafted image as a pro-business and graft-free administrator. Two investigative websites — Cobrapost.com and Gulail.com — said earlier this month that they had access to 267 audio recordings that had been handed over to the Central Bureau of Investigation (CBI). They said the recordings contain telephone conversations in which Amit Shah, the BJP national general secretary and a close aide of Modi, directing the illegal surveillance of a young woman — christened ‘Madhuri’ by the journalists to protect her identity — in August-September 2009. Shah had allegedly ordered the intrusive surveillance of the woman at the behest of someone mentioned on the supposed recordings of the event only as "saheb", whom many commentators have taken to mean was Gujarat Chief Minister Modi. 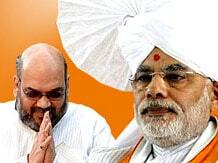 The BJP has dismissed the charges as part of "dirty tricks" by the Congress in the lead-up to the polls. 2) Did unlawful surveillance take place? The BJP acknowledges that Modi had used government resources to monitor “the girl,” but did so because her father had requested security for her, so it was not a violation of her rights. But, this explanation leaves a key question open: what was the authorisation for such extensive tracking, tailing and snooping? S K Saikia, then Ahmedabad's police commissioner, has told television news channel NDTV that he was not aware of any paperwork for such surveillance, and that he should have been had it been legal. If regulations were not fully followed, then it amounts to an illegal invasion of privacy, whether or not the girl's father knew about it. Neither morally nor legally does a parent have the right to organise intrusive surveillance of their adult child. 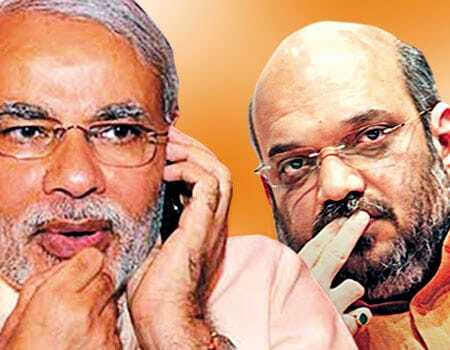 3) Have Modi & Shah reacted to the controversy? Whatever the intention behind the report, it raises pertinent questions for Modi and Shah to answer. But both of them have chosen to remain silent, which has only added fuel to the fire. Modi accused the Congress of employing “cheap tricks”, alluding to reports on two websites of the illegal surveillance of a young woman. Till date, neither Modi nor the Gujarat government has officially commented on the transcripts. 4) Why has the BJP's defence crumbled? The BJP has compounded the problem by attempting a heavy-handed cover-up. Several letters purportedly written by Pranlal Soni have been made public, in which he has claimed to have requested Modi to "provide security" for his daughter while she was in Ahmedabad. But circulating the letter actually caused more damage as it inadvertently admitted that the state machinery was misused for spying on a private citizen. The BJP argues that if Soni and his daughter don’t want an investigation into the surveillance, why is there a problem? India Today reports that their other defence is that the woman’s father wanted protection for his daughter who he believed was in an “inappropriate” relationship with the already married Pradeep Sharma. The Gujarat government has been at odds with Pradeep Sharma, a 1984-batch IAS officer who was suspended by the Modi government after his name figured in five cases of corruption in land deals during his tenure as Kutch collector between 2003 and 2007. He was arrested in 2010 and jailed for over a year before he got bail. 5) What is the CD angle in the snoop row? The Supreme Court has agreed to hear, in the first week of December, allegations about a Modi aide having ordered a snooping operation. The hearing will come in connection with an old plea by Sharma seeking transfer of corruption cases against him from the state police to the CBI. Sharma has accused the Gujarat government of fabricating the cases and claims it did so because, among other things, he knew about the August 2009 surveillance on the woman. He alleged that he was targeted because his elder brother, 1978-batch IPS officer Kuldeep Sharma had “unmasked” many of Modi’s misdeeds since the 2002 riots. Kuldeep Sharma had helped the CBI nail Modi’s right-hand man Shah in the Sohrabuddin fake encounter. Pradeep Sharma’s affidavit also claimed that he was targeted because Modi mistakenly suspected him of possessing a CD that could sully reputations. The affidavit said the alleged surveillance and tapping of the woman's phone violated the Indian Telegraph Act, 1885, and disregarded the apex court’s 1996 guidelines against such measures being taken without following rules. A) Saheb: The mysterious figure that figures in Shah’s conversations with trusted IPS officer G L Singhal. It’s believed that Saheb was Modi. B) Amit Shah: He is Modi’s trusted lieutenant who ordered survelliance of the woman at the behest of Saheb and kept her under close watch. C) Pranlal Soni: Madhuri’s father has known Modi for long. On November 15, he said he had orally requested Modi to “take care” of his daughter. On November 17, he told the National Commission for Women his daughter does not want the matter probed as there was no encroachment on her privacy. His sons floated energy saving firm Ecolibrium Energy, which worked with the Gujarat government. He helped revamp Saraf Bazaar after the 2001 Bhuj earthquake. D) G L Singhal: Supervised Madhuri’s surveillance and recorded all conversations he had with Shah. Accused in Ishrat Jehan fake encounter case, he got bail in May. E) Madhuri: The woman (whose name is not being disclosed) is a landscape architect. She was kept under illegal watch by the Modi government. She worked on projects in Kutch, where Pradeep Sharma was collector. She was hired as an architect for a “beautification project” to develop a Hill Garden in Bhuj district. Now married to an Ahmedabad-based businessman. Modi attended her wedding in 2010. She was working closely with Kutch collector Pradeep Sharma on the reconstruction works. 2009: Shah ordered cops to track Madhuri’s movements. IPS officer G L Singhal recorded a series of conversations after the meeting. Two websites — Cobrapost.com and Gulail.com — released the tapes. The congress demanded a probe by Supreme Court judge. November 2013: The Gujarat government appointed a two-member commission of inquiry on the snooping row and asked it to report within three months. A retired woman judge of Ahmedabad High Court, Sugnyaben K. Bhatt, heads the committee whose other member is former Gujarat additional chief secretary K C Kapoor.